An okay album that, despite the very metal looking original cover, is firmly dwelling in the realm of commercial (pop) metal. It’s a slice of cheese pizza loaded with Parmesan. If you don’t believe me, all you need to do is look at photos of Ozzy and his band from this time. I’ve always thought Ozzy looked ridiculous with that blonde hair and sequined, sparkly robes and pants. The album starts off pretty good and promising with the catchy “The Ultimate Sin” and “Secret Loser” but falls apart over the course of the next three tracks. The action picks up again with “Lightning Strikes” and “Killer of Giants” (which was the original title of the album) and ends with “Shot in the Dark”, the real reason I bought this album. I’ve always loved that song and it’s probably my favorite Ozzy song, period. On this remastered edition (yes, again with the awful border on the cover), “Shot in the Dark” has been edited down for some reason. Basically, despite a few cool songs, this is just another Ozzy album to me and I only bought it because I own pretty much everything else Sabbath-related and I was able to get this for just a few bucks. Here’s the thing about Ozzy: I know he has this tag as being the “godfather of heavy metal” but other than the Sabbath years he’s never really been all that heavy to my ears. Though metal and at the very least hard rock, his solo stuff has always had a more commercial melodic sound so I’ve never really gotten the hype surrounding him being the “Prince of Darkness” (let’s be honest, a lot of his stuff has a pop-metal vibe). I’ve found that throughout most of his career, he’s a mediocre singer who has been lucky enough to almost always be surrounded by talent musicians and songwriters. 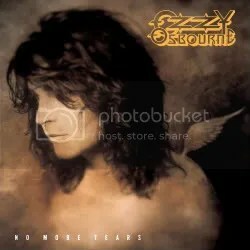 Onto the album itself, No More Tears is one of Ozzy’s best selling albums and featured a number of hit singles. For this reason, despite having just recently purchased the album, I’m kind of already sick of it because I know these songs well. “Mama, I’m Coming Home”, “Time After Time” and “No More Tears” are still radio staples in my area after all these years so it’s hard to judge them with a clear mind and say whether they are true album highlights because I’m so sick of both. It’s really the lesser known songs that I find myself enjoying. I think “Desire” and “Hellraiser” are especially strong (Lemmy wrote lyrics for both). A classic to many, filler to me. I picked this one up along with Vince Neil’s Tattoos & Tequila at BestBuy.com for $7.99 and free shipping and just like the Vince Neil album, I originally had no plans to pick it up. That’s the one good thing about the music industry being in the dumpster these days — low prices finally, otherwise I wouldn’t have given this album a second thought. At $8, I figured if I didn’t like the album I wouldn’t be losing too much and at least it’d be another new release to review. To my surprise, I’m actually enjoying the album a lot. It was a blind purchase, I hadn’t read any reviews at the time of purchase and it’s a good thing — most reviews are saying it’s either average or bad. Of course, I’m wouldn’t really call myself an Ozzy fan so my expectations were quite low in the first place and went in with an open mind. It seems the major controversy surrounding this album is the new guitarist Gus G. replacing Zakk Wylde. Honestly, you really can’t tell Zakk’s not here. Most of the album was written by the time Gus signed on and there was very little wiggle room to leave his own personal stamp on the songs. He’s basically playing as if he was Zakk which makes you wonder why Ozzy/Sharon got rid of Zakk in the first place. I think most fans would have accepted Gus with open arms if he had been given free rein but the fact that he wasn’t seems to be the deciding factor for most people. I’m told Gus is a great guitarist from his days in Firewind but I’m totally unfamiliar with that band. Oh well, I’m sure within the next year or so Ozzy will put out yet another live album to document the upcoming tour and then maybe the guitar aficionados will be pleased with Gus’ performance then. Scream keeps the pace with his last two albums… or with what I’ve heard from them. Ozzy’s always done a good job of keeping his sound updated (even if the songs themselves aren’t always good) and he continues on the post-grunge/nu-metal/low-tuned guitars path that he started with 2001’s Down to Earth. 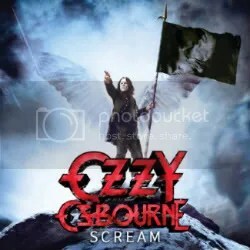 There’s not a lot of flash on this album, it’s modern sounding heavy metal and the only time Ozzy gets close to his ’80s heyday is with the ballads but those ballads are very well done. The album is bogged down with a few generic metal numbers but overall I’ve enjoyed the it… and a bit more than self-proclaimed Ozzy fans have apparently! Previous to this, the only Ozzy albums I’ve owned were Blizzard of Ozz and Diary of a Madman. Both albums have their moments but neither are personal favorites of mine. I’ve just never taken to Ozzy’s voice or bought into the whole image that he’s the end-all be-all of heavy metal. He’s always been a bumbling fool to me, even previous to becoming a reality star/heavy metal joke. Still, I’ve come to appreciate his run with Black Sabbath and after being entertained by this disc, I’m interested in checking out some of his other solo work. 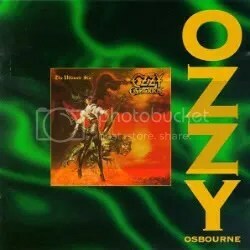 The Ozzy logo and album title you see on the album cover is not actually a part of the artwork. For my copy, it was a sticker on the cellophane wrapper. Pretty strange but it peeled off easy & clean and I slapped it on the cover of the jewel case to make it look proper. Geez, I really hate these ’95 Ozzy reissue covers. That huge border is SOOOO annoying. As much as I can’t stand Ozzy’s voice, his second solo disc is a worthy follow up to his 1980 debut, Blizzard of Ozz. 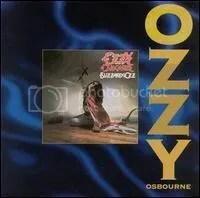 Despite Ozzy Sharon Osbourne trying to erase Daisly & Kerslake’s contributions from the album, this was a really tight unit and depending on who is telling the story, Ozzy, Randy, Bob and Lee all had a hand in writing the album. The story of Daisy and Kerslake’s involvement with Ozzy is quite a strange one. They weren’t even credited when the album was released, instead bassist Rudy Sarzo and drummer Tommy Aldridge were (Don Airey was also ignorantly credited on keyboards when it was in fact Johnny Cook who played on the album). 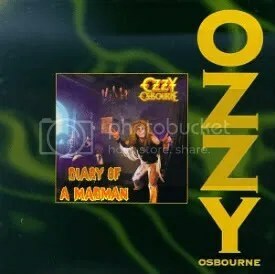 Then when the Ozzy albums got yet ANOTHER reissue in 2002, then Ozzy bassist (and future Metallica bassist) Robert Trujillo and then Ozzy drummer Mike Bordin rerecorded Bob and Lee’s parts. Oh well. Sharon may not want to give them credit for their time spent in Ozzy’s band, but true rock’n’roll fans know the score and that’s all that matters. Back to the album, I think this is far superior to his debut and it’s probably Ozzy’s best. The music is so good, I can even withstand his voice! I think a big issue with my lack of enthusiasm over this album is that a) I was just a few months short of being born when it was released (thus missing out on early 80s Ozzymania) and b) these songs have been played to death on radio. Some albums can lose their impact after you’ve heard them a million times (before you even get the album) and that’s what is happened with me, I think. I didn’t get my hands on this album (picking up Diary of a Madman as well) until a few years ago during one of my BMG Music raids. And even then, I only picked’em up because I had gotten pretty much everything else and I wanted to a least own an Ozzy album so I could know whether I was truly nonplussed by him or not. Granted, taking a step back from familiarity, these *are * really good songs with “Mr. Crowley” being my fave and the most sinister sounding on the album with some terrific guitar work from Randy Rhoads. “Goodbye to Romance” is another personal favorite, it’s a keyboardy (new word!) ballad that falls into the “so cheesy it’s good” category.